Plans for 53 new homes near Rudgwick have been turned down by a neighbouring council. Earlier this year Cox Green residents described feeling ‘under siege’ from developments, with two housing estates proposed just outside the parish boundary. 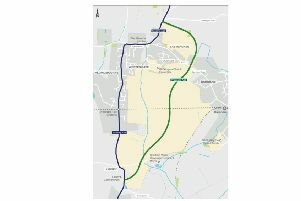 Conservative John Bailey, who represents Rudgwick at Horsham District Council, wants permission for 57 homes at Windacres Farm near to land he sold to Berkeley Homes, which is currently building 55 new properties and office space. Another developer John Beckwith-Smith is looking to build 53 homes on the other side of the B2128 with access off Cox Green Road. But his application has now been refused by Waverley Borough Council as both sites are in the neighbouring Ewhurst parish. A decision notice issued by Waverley council planning officers describes how the development would result in harm to the landscape and character of the area, would result in a cramped layout, fails to provide an appropriate mix of market and affordable housing, would affect the setting of a nearby Grade II listed building, does not include any provision of formal playspace and has not demonstrated safe and suitable pedestrian access can be achieved. Mr Bailey’s application has yet to be decided by Waverley. However since the access for the site is within the Horsham district, a separate application was filed with HDC. This was approved by councillors earlier this month.